Well, that's just silly. Quintessential White People Problems. Cosmopolitan's article 20 Things Your Hairstyle Says About You is more intriguing, based on author Jean Haner's "studies in 3,000-year-old face reading derived from Chinese medicine." Wait, face reading? I am so going there. Apparently, Haner is interpolating her hair wisdom in the "20 Things" article from the Chinese ancient practice of Mien Shiang. 6. 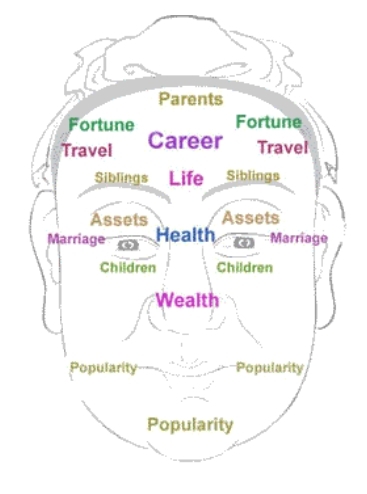 House of Siblings (Xiongdi Gong) -- Eyebrows and the areas directly above them represent it, and it also oversees your relationship with your friends and colleagues. The state of your hair has a direct connection to the physical conditions of your parents at the time when you were conceived, which means it has a lot to do with your genetic make-ups. Brows that are dark, thick, long, smooth, orderly and located high above eyes indicate a healthy hormone level that gives rise to affection, calmness and courage. If they look sparse, thin, pale, short, or chaotic, or too close to eyes, or marked with a scar, you could be tormented by your own physical or emotional states. Okay, we're talking rampant generalizations again. But it's got me thinking about the reality of "hair reading," about the human tendency to generalize about a person's personality based in large part on their hair. It is what it is.